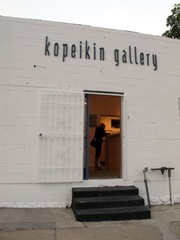 Kopeikin Gallery is an accessible place where information and conversation flow freely. People stop by to see the current exhibition and what's new in the back room. We talk about the latest photographic monographs, since books are such an important part of the photo world, and we look beyond photography to a shared interest in all art; of which photography is an increasing important part. We specialize in helping build collections and pride ourselves on being able to obtain and sell virtually any photograph, whether or not it's in our current inventory. This site will keep you informed as to what's of particular interest to me and the artists I represent.